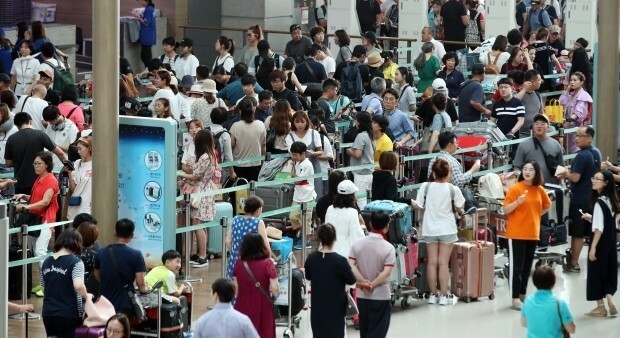 The South Korean government on Thursday gave the green light to the long-debated opening of duty-free shops at airport arrival areas, starting with a six month-trial at Incheon Airport. According to the Finance Ministry, the decision was made during a meeting of economy-related ministers on Thursday. The deregulation measure intends to reduce discomfort experienced by tourists and boost the competitiveness of domestic airports, it added. Since 2003, the introduction of duty-free shops in areas where passengers disembark has been discussed and debated among the ministry, airport corporations and customs authorities. South Korea’s duty-free stores at Incheon Airport and Gimpo Airport are currently available only to those departing the country. The country’s first arrival duty free-shop will be set up at Incheon International Airport by as early as May next year and operated for six months on a trial basis. Arrival duty-free business will then gradually expand to other major domestic airports like in Gimpo and Daegu, the ministry said. Items available at the new duty-free shops will be similar to those sold at duty-free shops inside the departure lounge, except for cigarettes and products that need to go through quarantine, the ministry said. The ceiling on duty-free purchases, $600, will remain the same. The government said it would work on related legislation to permit duty-free businesses in arrival areas by June next year. Currently, about 149 airports in 73 countries around the world already operate duty-free shops in their arrival areas. Neighboring countries like China and Japan operate duty-free stores in arrival halls. In August, President Moon Jae-in ordered a review on the opening of duty-free stores at arrival areas, saying that the new duty-free shops could boost domestic spending by both Korean and foreign travelers.